Born on December 28, 1926 to Reverend Wade Hampton McKinney and Ruth Berry McKinney in Flint, Michigan, Samuel Berry McKinney would become a Baptist minister, author, and civil rights advocate in Seattle, Washington. He served as pastor of Mount Zion Baptist Church, one of the largest and oldest black churches in the Pacific Northwest, from 1958 to 1998 and again from 2005 to 2008. As a child in Cleveland, Ohio McKinney was shaped by his father who challenged racism, and invited civil rights leaders such as Thurgood Marshall to speak frequently at his church. McKinney attended Morehouse College with the intention of becoming a civil rights lawyer, but changed paths after encountering Morehouse President Benjamin Mays who encouraged him to become a minister. McKinney, a classmate of Martin Luther King, graduated from Morehouse in 1949 and enrolled in New York‘s Colgate Rochester Divinity School, graduating in 1952. One year later he married Louise Jones, an educator and activist in her own right. The couple has two daughters. McKinney served as pastor of Olney Street Baptist Church in Providence, Rhode Island between 1955 and 1958. He arrived at Mt. Zion in 1958, beginning an activist ministry that transformed the church and Seattle. At Mt. Zion, McKinney established numerous programs that assisted the black community including the Mount Zion Baptist Church Credit Union in 1958, the first Protestant credit union in the state of Washington. McKinney was a founder of Liberty Bank, the first black-owned bank in Seattle and was the first black president of the Church Council of Greater Seattle. In 1966 McKinney founded and served as president and CEO of the Seattle Opportunity Industrialization Center. He later led the construction of Samuel Berry McKinney Manor to house elderly and working poor people which was completed in 1998. Under his leadership the Mt. Zion Pre-School and Kindergarten, and the Ethnic School (later the Louise Jones McKinney Learning Center), were founded. In 1975 he earned a Doctor of Ministry Degree from the Colgate Rochester/Bexley Hall/Crozier Theological Seminaries. In the same year he also published Church Administration in the Black Perspective, with Floyd Massey. 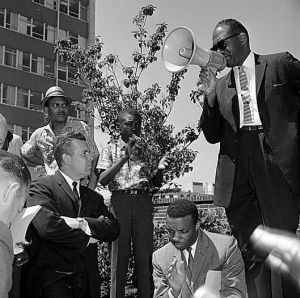 By the 1960s McKinney became one of the most powerful voices for civil rights in Seattle, participating in demonstrations for equality in housing, employment, and education. He also played major role in the local Central Area Civil Rights Committee. In 1961 Dr. Martin Luther King, Jr. made his only visit to Seattle, at the invitation of McKinney. In 1965 McKinney joined in the Selma to Montgomery Voting Rights march which pressured the U.S. Congress to enact the 1965 Voting Rights Act. Continuing his activism into the 1980s, Rev. McKinney was arrested in 1985 protesting apartheid at the South African consul’s home in Seattle. He later chaired the Washington State Rainbow Coalition. Dr. Samuel Berry McKinney died in Seattle, Washington on April 7, 2018. He was 91 at the time of his death. L' Erin A. Donahoe and Shaun A. Spearmon, Oba: Men of African Descent Making a Difference in Seattle (Seattle: L. Donahoe and S. Spearmon,1997); Mary T. Henry, “McKinney, Samuel Berry (1926- ),” HistoryLink.org Online Encyclopedia of Washington State History, http://www.historylink.org/; Quintard Taylor, The Forging of a Black Community: A History of Seattle's Central District from 1870 to the Civil Rights Era (Seattle: University of Washington Press, 1994). Making a Difference in Seattle (Seattle: L. Donahoe and S.
Civil Rights Era (Seattle: University of Washington Press, 1994).